« Consciousness is all there is. When you look at the Outer World also known as society what you are seeing is a reflection of the collective consciousness. For many of us much of the outer world seems nonsensical at this time. The reason… is that much of the population is focused on changing “The World” instead of changing themselves. Everything starts inwardly and manifests outwardly , in other words , everything is happening within consciousness, there really is no “Outer World” empirically. So “knowing” this… the best course of action is to change yourself ! Be the change you want to see in the world as they say and you will begin to see the reflection of those changes in your personal and collective experiences. Your personal reality tends to react more quickly to these inward changes. The “Outer World ” seems to change a bit more slowly, however if you look closely you will start to see changes in society that are more reflective of the changes that are occurring within you. Right now the reason that much of the world seems nonsensical is that the collective we are still participating in is still very diversified, still evolving, still forming a new consensus reality along side the old one. However as you hold the vibration of your preferred state of being along with definitions and beliefs that serve you and others out of unconditional love, you will shift to a version of earth , a version of reality that is more and more in alignment with your core vibration. This is pure physics , the structure of existence , the way it works. 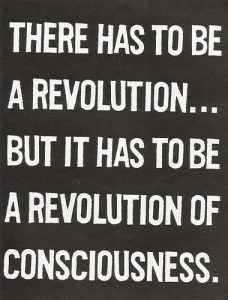 The only revolution of consciousness that will have any real effect on your experiences is the one happening within you !